Executive Chef Craig Patzer and Sommelier Eugenio Jardim of Jardinière in San Francisco, California share a delectable taste of the restaurant's French-California cuisine with recipes for a wine pairing dinner. I met with Executive Chef Craig Patzer and Sommelier Eugenio Jardim when I was in San Francisco in late January 2009. During the course of our conversation, I learned that Chef Craig Patzer was born in Sonoma, California surrounded by orchards, vineyards, and berries, where his family raised rabbits, chicken, sheep, and cows; a background similar to Chef/Co-Owner Traci Des Jardins. Although he once wanted to pursue a career in microbiology, he changed his focus and graduated from the CCA in San Francisco, honing his craft first in San Francisco, followed by stints in Chicago and Dallas, before returning to San Francisco where his heart remains. He feels that the culinary scene has changed throughout the years, and that people have changed the way that they eat. As a chef, he likes casual food, to try little bites of this and little bites of that, with a casual, fun, yet approachable fine dining experience, which Jardinière has clearly established, where guests have two dining options, either enjoying cocktails and sampling from a smaller, more casual menu in the comfortable Lounge, or having dinner upstairs for a fine dining experience. When it comes time to discuss the Jardinière's housemade charcuterie, which is clearly Chef Craig Patzer's passion, his face lights up. 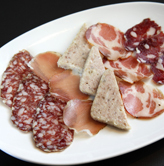 He discovered the art of charcuterie about 6 years ago, which he said takes years to master, and uses the finest quality ingredients supplied by a rancher in Marin County, California. Taking a tour of the walk-in refrigerator where he has 500 pounds (227 kgs) of several different charcuterie products hanging, was an amazing experience as he discussed the cut of pork, the style, and the aging process of each, which takes anywhere from 3-months to 1-year to age. The Jardinière menu not only changes seasonally, 25% of the menu changes daily, with the recipes evolving throughout the night, which makes it more fun for him to cook, as well as for the regulars who come pre or post performance from the nearby Opera and Symphony houses. When not at the restaurant at work developing new recipes, Chef Craig Patzer spends time with his wife, his 15-month old daughter, and renovating his house. Sommelier Eugenio Jardim grew up in Brazil, in a family of Italian descent, where Sundays meant family dinners of pasta with sauce and meat, and straw-wrapped bottles of Chianti, which his father would take out of the refrigerator. After what he calls his "horrendous Sunday wine experience," after graduation from college he did PR work for one of the best restaurants in Brazil where he was surprised to learn that wine could taste so good. 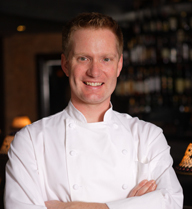 He has since honed his palate to perfection, and enjoys working with Chef Craig where they work together on wine pairings. What he likes about working at Jardinière is that Chef Traci, Chef Craig, and he think alike when it comes to wine and food pairings. 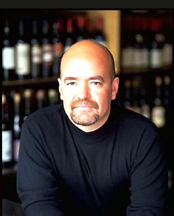 He describes wine tasters as either powerful tasters (big, bold wines that speak to them) or sensitive tasters (people that appreciate the subtle nuances of the wine), which fits the three of them. Chef Craig Patzer and Sommelier Eugenio Jardim are pleased to provide recipes for a three-course wine-pairing menu that showcases Jardinière's tempting style. Method: Generously season the tuna with salt and pepper. In a sauté pan over high heat, add 1 tablespoon of oil and sear the tuna on both sides until browned, yet still very rare inside. In a bowl, mix the avocado, tomatoes, and beans. Add the olive oil, lemon juice, basil, salt, and pepper to taste. Tear or cut the tuna into chunks and mix with the other ingredients and give the salad a little time to marinate. Presentation: When ready to serve, cut the romaine crossways and mix into the marinated tuna. Spoon the salad onto six plates and serve at room temperature or chilled. Pair with the Roederer Estate Brut Rosé, Anderson Valley NV. Tomato Sauce Method: Sweat onions and garlic in chili oil until soft. Add tomatoes and cook to release their juices. Slice the calamari into rings, and add the sauce. Slowly cook for 45 minutes or until the sauce has thickened, and the calamari is tender. Method: Preheat the oven to 375°F (191°C). Bake the potatoes on a pan lined with parchment paper. Using a timer as reminder, turn the potatoes every 15 minutes to insure even baking. Potatoes will be cooked after about 70-80 minutes. Cover the cooked potatoes to steam for 10 minutes, then peel and rice. Using a fork to make a well in the potatoes, mix in the yolks, and then knead in the flour and the salt. Cut the dough into sections and roll into long tubes. Dust the dough with lots of flour and cut into ½ inch gnocchi. The gnocchi can be cooked immediately or frozen and stored for up to a month. Serving Directions: Boil the gnocchi until they float, add the sauce, and garnish with the mint. Pair with the Do Ferreiro Albariño, Rias Baixas, Spain 2007. Method: Coat the lamb with olive oil, add half of the garlic, thyme, and marinate overnight. Preheat the oven to 300°F (149°C). Place the peppers in a heavy baking dish; add the rest of the garlic cloves, thyme, ¼ cup olive oil, salt, and pepper. Cover and bake for 1-hour or until the peppers are soft but not mushy. Sauté the eggplant in olive oil on medium heat until soft, season with salt and pepper, and set aside. Mix the beans, peppers, and eggplant together, season with salt and pepper, and set aside at room temperature. Salsa Verde Method: Mix the shallot, almonds, chopped mint, parsley, and olives together in a bowl. Add 4 tablespoons of olive oil and adjust with salt and pepper. Lamb Method: To cook the lamb, season the meat with salt and pepper. Heat a sauté pan to medium-high heat and add 2 tablespoons of olive oil. Sear the lamb on all sides until golden brown, about 5 minutes per side. Place the lamb loin in a warm place to rest for at least 10 minutes. Presentation: To plate the dish, spoon some of the bean mixture onto each plate, slice and add the lamb to the plate. Toss the arugula with olive oil, sherry vinegar, salt and pepper, sprinkle over the meat, and spoon over the almond salsa verde. Pair with the Boekenhoutskloof Syrah, Coastal Region, South Africa 2006. Jardinière is located in the Hayes Valley section of San Francisco, and is open for dinner daily. Read about Jardinière in the Destinations and Restaurants section.